This review will examine one of Skin Pro’s products called Medical Grade Skin Care Ultra Brightening Skin Lightener. It is designed to eradicate dark spots, such as sun spots, age spots, liver spots and freckles by several shades. It also prevents future occurrences of hyperpigmentation and uneven skin tone. The manufacturer claims that after applying this cream, the darkened cells in the skin are replaced with new, fresher, lighter cells that restore a more even skin tone. The key ingredient in this product is Hydroquinone, which the manufacturer claims to be the most effective ingredient for fading and whitening uneven skin tone. Hydroquinone works by reducing the production and improving the breakdown of melanin pigment granules in the skin’s pigment cells. It does this by inhibiting melanin synthesis in the skin, which plays a key factor in bringing dark spots to the skin’s surface. For some reason, in the list of ingredients, the active ingredient is listed together with inactive ingredients. This is an incorrect way of labeling. Consumers should be able to see the main ingredient without having to search much to find it. Other ingredients include Kernel Oil and Simmondsia Chinensis (Jojoba) Seed Oil. Wash the affected area with warm water, and dry it properly before applying the lotion. Thereafter, apply 2 coats with the brush directly to the area allowing the solution to dry between coats. Repeat this procedure twice daily as needed for up to 12 weeks. You can purchase Medical Grade Skin Care Ultra Brightening Skin Lightener through the manufacturer’s website for $43.99. It is also sold through online retailers at varying prices. The price is a bit more than the price of similar products on the market. However, discounts are also available at selected retailers. On the manufacturer’s website, there is a sticker that indicates that they offer a 100% satisfaction guarantee. However, we did not find any other information relating to this, which is concerning because one can’t just believe that they are covered when it is not indicated how long the guarantee is valid for. 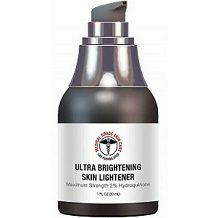 Medical Grade Skin Care Ultra Brightening Skin Lightener could be beneficial in reducing the appearance of dark spots, freckles, and pigmentation. It uses an ingredient that has been used in many skin lightening products. It is available through various retailers, therefore, you have any options to choose from. Discounts are also available at selected retailers. We are not impressed that the active ingredient is listed together with inactive ingredients on the manufacturer’s website. This makes it difficult for customers to instantly know which one is the main ingredients. Furthermore, there is a sticker that claims that there is a 100% money-back guarantee on this product. However, we could not find any other information other than the one on the sticker. Lastly, the consumer reviews are concerning because there are more critical ones than positive ones. Many consumers claim that the product did now work for them. Considering that there is no money-back guarantee on this product and that it might not work for you, we recommend that you look for something else.